Mon. 13 Yesterday and today lieutenant Mayer was beastly drunk and misbehaved himself generally. Captain McKelvey and I visited the fort, and saw the 25 Wisconsin on battalion drill. I stop at the Frankfort Hotel, Columbus is very much improved by general Asboth. Had three daguerreotypes of myself taken sent one to Carrie one to my parents and kept one myself. Tues. 14. It rained a little this morning which compelled me to stay in the house, so I did some writing. Strolled about town in the evening. Went to the German Ball, but not finding enough people there to make it interesting, I went back to the hd. Wed. 15. This is a chilly and disagreeable day. Wrote three letters this morning. 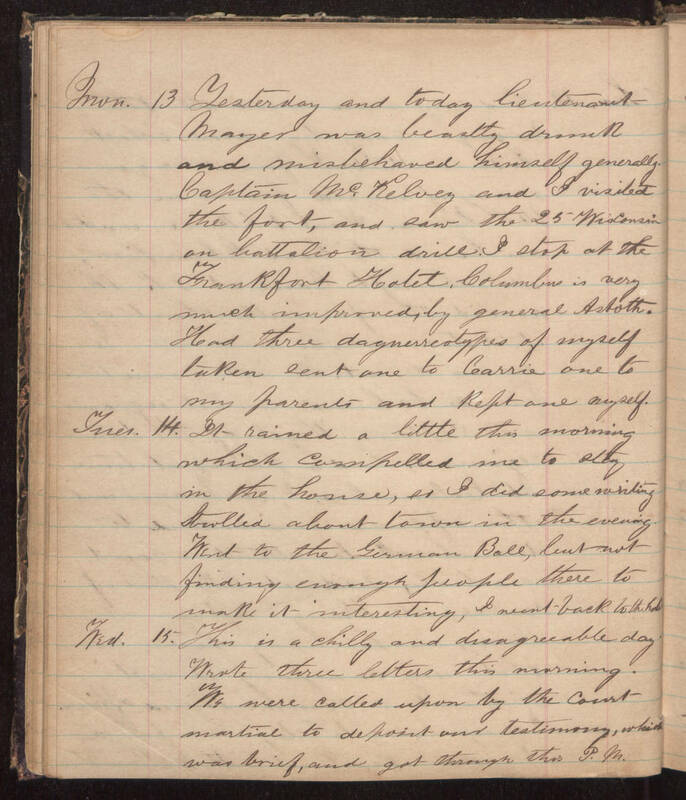 We were called upon by the Court martial to deposit our testimony, which was brief and got through this P. M.